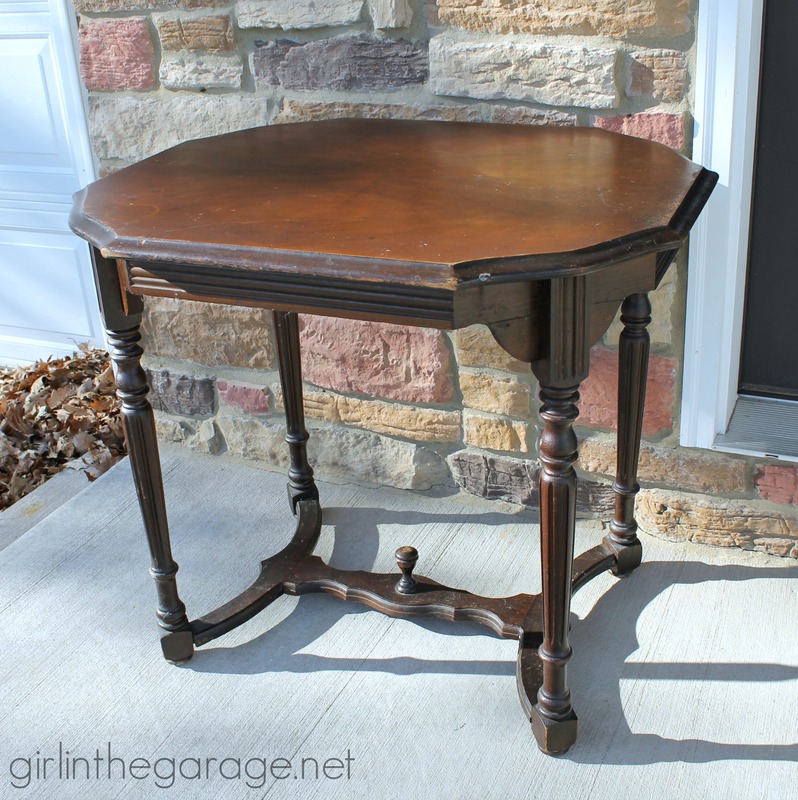 I had a few ideas but finally decided on this antique table after visiting my storage unit a couple weeks ago. 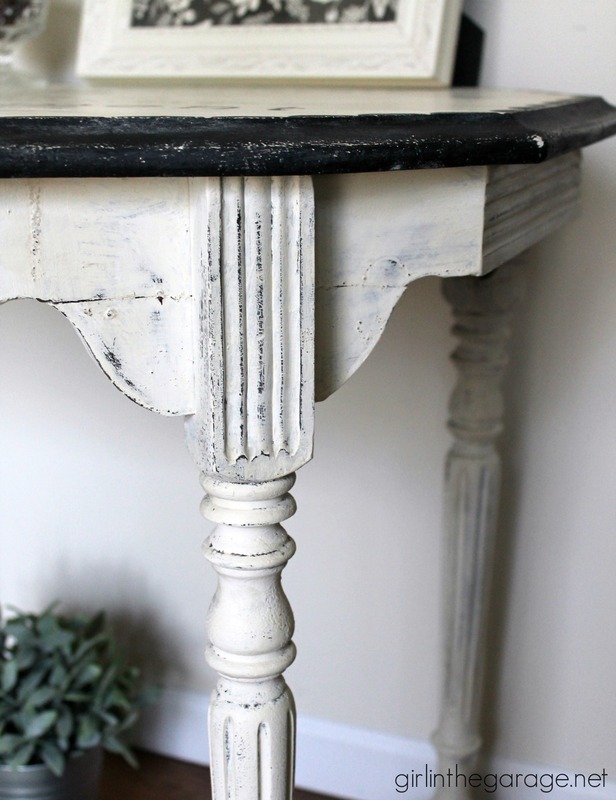 Since I didn’t want to take any chances with bleed-through, first I primed it and then painted it in Old White Chalk Paint by Annie Sloan. 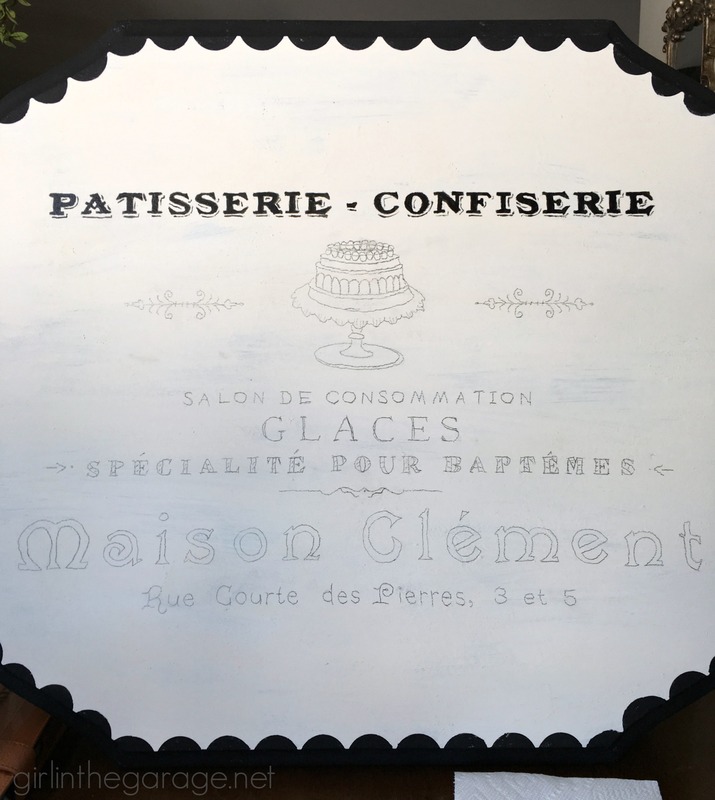 I found a French graphic online and wanted to make the top look like a vintage pastry shop sign. 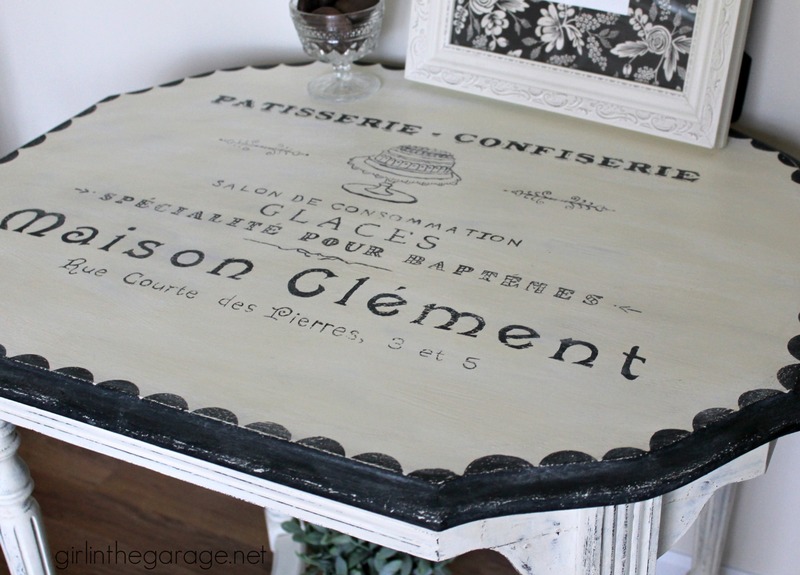 I used my FrogTape Shape Tape and painted a scalloped edge around the table. 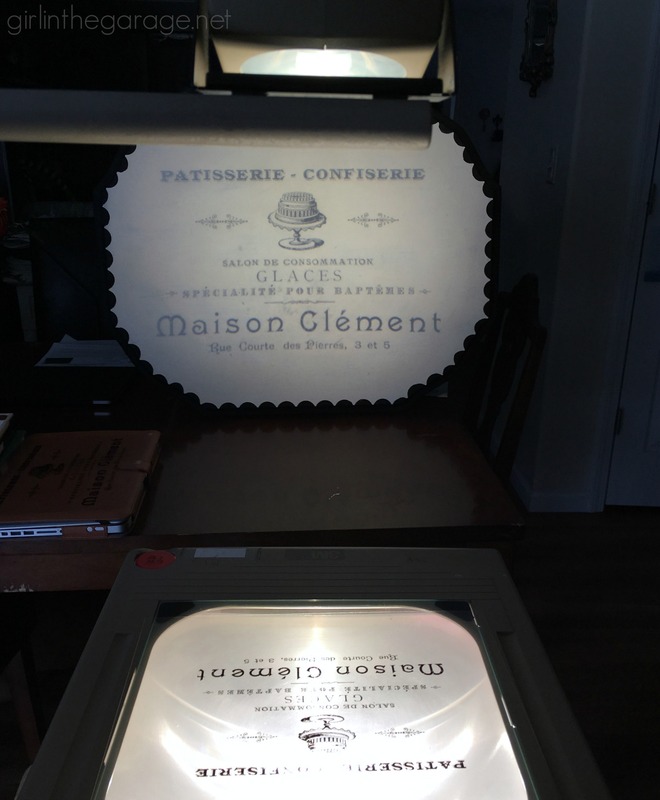 Then I laid the table on my dining table and traced the image from an overhead projector. After penciling, I started painting with a tiny brush. I’m not gonna lie, it was tedious! I’ve used a Sharpie on similar projects before but I wanted to distress this piece, so I used regular black paint. It took a while, but it was worth it! In the end I did distress it all over and then applied clear wax to protect it. 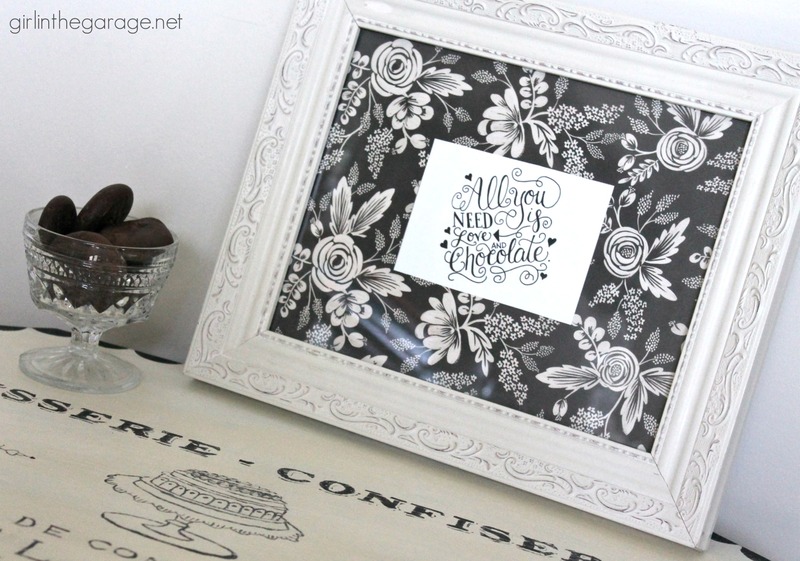 I found the perfect art to use – “All You Need is Love and Chocolate” – by Dawn Nicole Designs (get the free printable HERE) and added some lovely paper behind it. And of course included some chocolate cookies in a vintage dish. Be sure to click the photos below and visit my friends to see their interpretations of the Chocolate theme! What a sweet makeover, Jen! I love the scallops and your graphic transfer is perfection. WOW! Doesn’t even look like the same table! You can see so much more of the details it has now! So pretty! Your table is precious. I’m still searching for a decent priced projector as I would love to try it. All of this chocolate inspiration is making me hungry-what a fun theme! Tami @ Curb Alert! 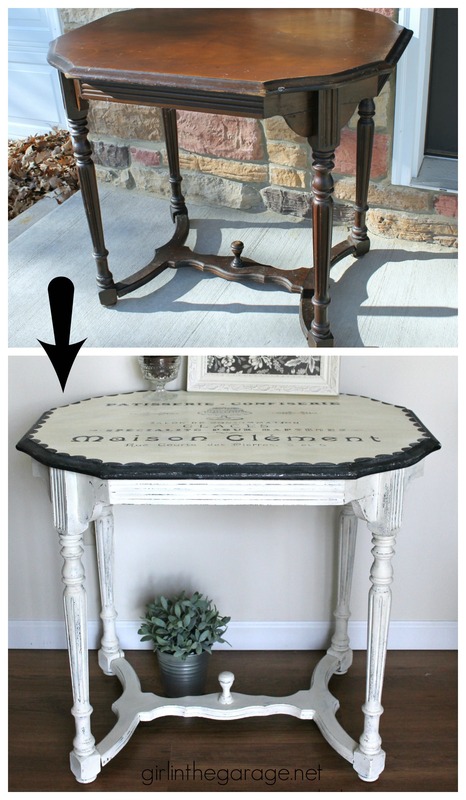 recently posted…Stenciled Dresser for Themed Furniture Makeover Day! This is something I would love to have in my bedroom. Linda, your compliment means so much to me! Thank you! love it and thanks for sharing the Frog tape scallops. I have never see that before. Your attention to detail is amazing. I love the staging and the scalloped edge is the perfect touch too. This is beautiful, Jen! Love the graphics, love the scalloped edge…the whole thing is perfection! 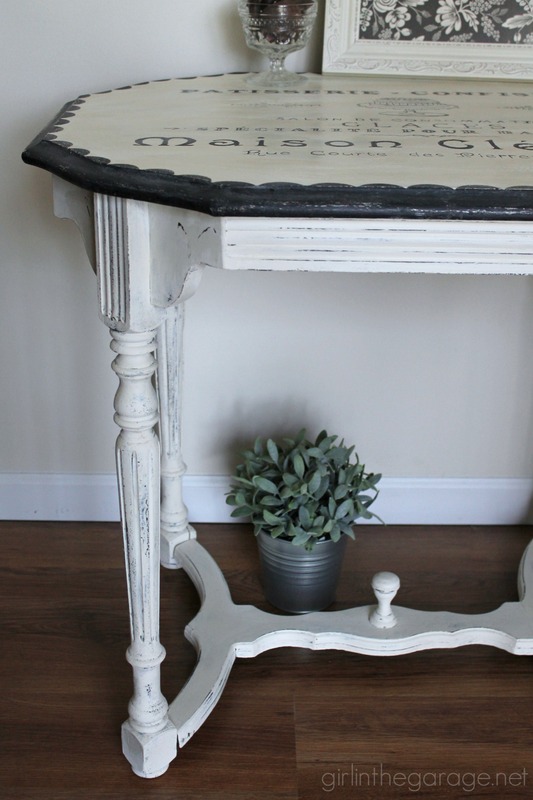 Your patience paid off – this table is gorgeous Jen! Gorgeous makeover, Jen! 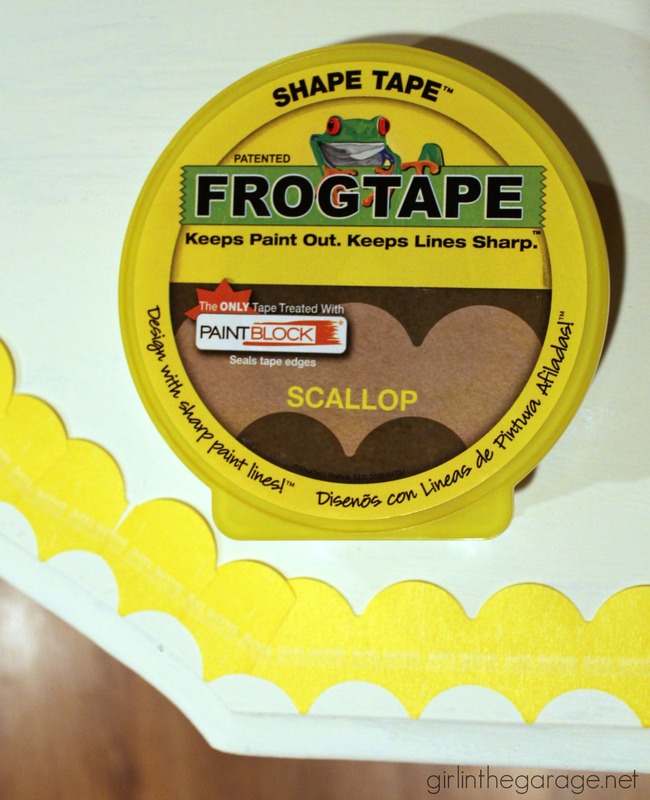 I love how you used the Frogtape to make the scalloped edge and that graphic is perfect for our theme. It must have taken forever to paint it but was well worth your effort in the end. My mom gave me a set of little compotes like yours that she says my grandmother got from oatmeal. Isn’t it fun that a useful piece of glassware used to be included in a box of oatmeal? This theme is such a good one and I’m loving this month’s projects. 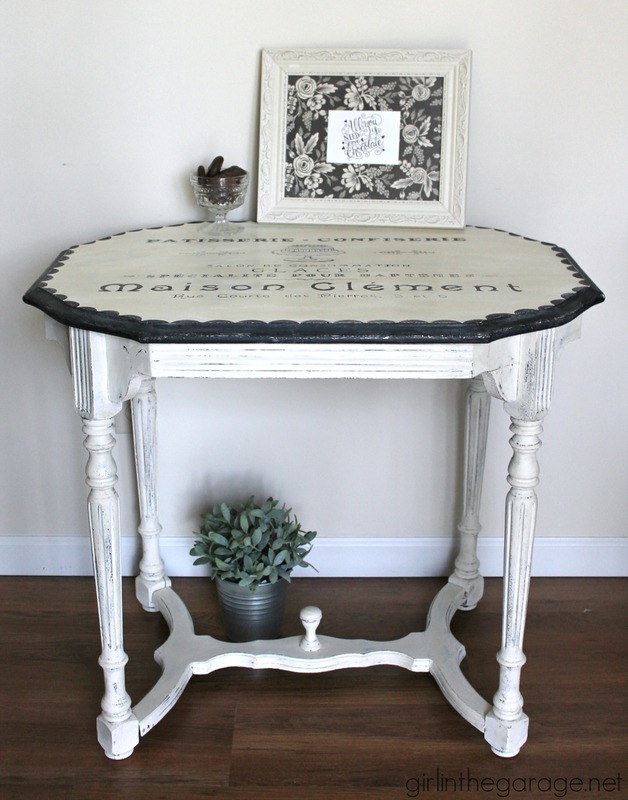 Such a BEAUTIFUL piece and I am giddy with how you did that scalloped edge. I never even thought to use the tape in reverse like that.. BRILLIANT! Gorgeous work as always! Girl, you have a lot more patience than I do. It did turn out great! Jen this is just beautiful!! I seriously love it! Amazing job! You were my pick for rock start at our Creativity Unleashed party this week! Please come by and vote for your project and invite you friends to vote! That was some serious hard work…it paid off. I love the table! Those scallops are great, how have I missed this tape!!?? Such a beautiful piece! This looks so pretty! I always enjoy your makeovers and this is another piece well done! You have a gifted eye indeed! I hope you have a great weekend! Hi, love this. Do you have to print your image on a clear sheet for the overhead? thanks!